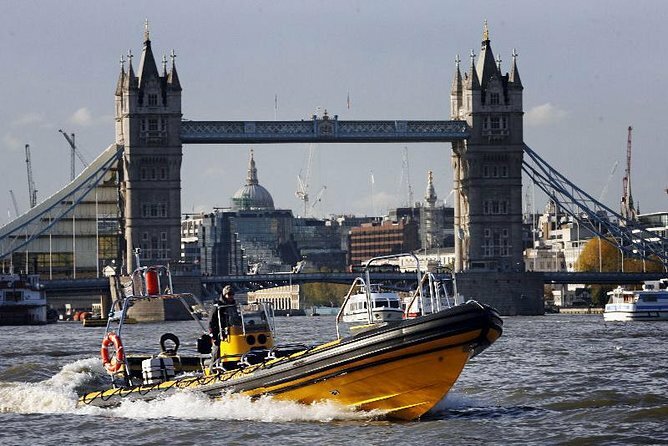 The super-powered Rigid Inflatable Boats (RIB's) are specially designed to operate on the River Thames. One minute you're cruising gently under Tower Bridge, the next you are racing out towards the Thames Barrier at a rate of 50 knots on a speed boat. This fantastic interactive guided tour takes in London's top sights and gives fascinating insight into their history. With a modern sound system on board you'll be sure to hear your guide's entertaining and informative commentary even at high speed. Choose between the 50-minute Canary Wharf Experience and the 80-minute Thames Barrier Experience. Take the Canary Wharf Experience to see the famous sights of the Houses of Parliament, HMS Belfast, Tower of London and Execution Dock. Or opt for the Thames Barrier Experience and in addition enjoy beautiful views of Greenwich and the incredible Thames Barrier, the world's second largest movable flood barrier. You will also be sped around the O2 Arena, filming location of the James Bond movie The World is Not Enough whilst listening to the movie soundtrack. Group sizes are restricted to 12 passengers on both tours, ensuring a personal and fun experience. London's number one action activity is not to be missed! Fantastic fun, highly recommend. Great way to see the sights from a different perspective, and some high speed boat fun thrown in! Fun commentary along the way and expert driving. My Dad 70, my son 9 and I all loved it. A great tour. A real must to do.